I know I’ve only seen a fraction of this continent, and it’s a little much to say I love an entire continent, but that’s kinda how I feel. That may change, but for now it’s safe to say I’m really feeling South America right now. I recently returned from an amazing trip to the Atacama Desert in Chile and 10 days of traveling around Peru. And I had such a fantastic time in both countries that I’m already thinking about where else in South America I want to visit next (so far I’ve seen parts of Argentina, Chile and now Peru). 1. Walking Along El Malecón in Lima - On a beautiful day, El Malecón in Lima is the best. You can look out toward the surfers in the Pacific Ocean on one side or, if you’re like me, check out the beautiful homes and apartments on the other (just trying to get a feel for where my future home will be located...). 2. The Flight from Lima to Cusco - The flight itself from Lima to Cusco is pretty straightforward but the views from that flight are just insane. The topography looks fake but it’s very much real and unbelievable to view from above. I've never seen anything like it. 3. 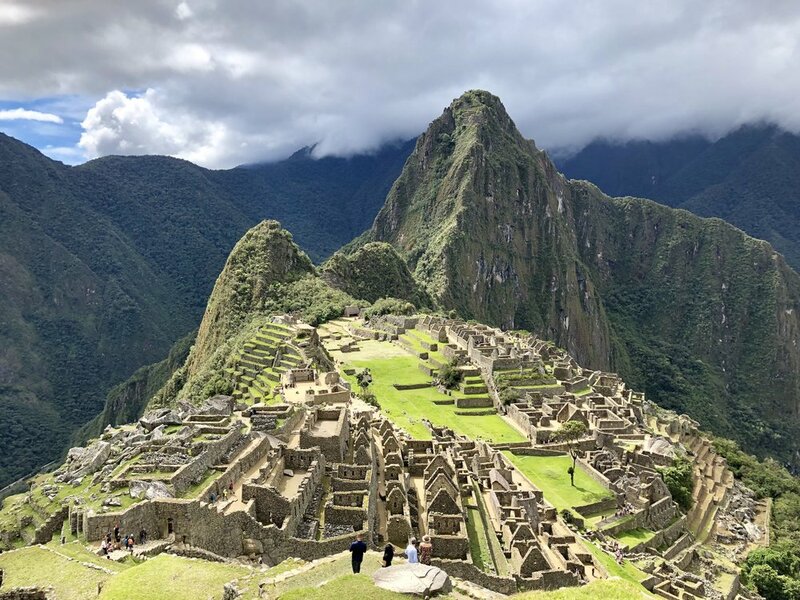 Looking at Machu Picchu from the Guardhouse - I admitted this recently on Instagram, but when I first got to Machu Picchu, I didn’t immediately love it. It wasn’t until I climbed up to the guardhouse and looked out at everything that I felt completely captivated by this 15th century Incan citadel. 4. The View from Part of the Inka Trail - After making my way to the guardhouse at Machu Picchu, I kept walking up and following a group of people until I hit a part of the Inka Trail. I didn't know where I was going but I just felt like going, so I did. The view from here was incredible and I’m so glad I accidentally found myself on this part of the trail. 5. My Cooking Class in Cusco - While in Cusco, I took part in a cooking class with Peruvian Cooking Classes that was fun, insightful and delicious. From our tour around San Pedro Market to the actual cooking that took place, I felt like I learned how to make several simple but delicious dishes. I loved it. 6. Driving Around the Sacred Valley - While many people flock to Cusco and Machu Picchu and then move on, the Sacred Valley doesn't get nearly as much love as I think it should. From the stunning views throughout the region, to the interesting places to see like the Maras Salt Mines and Moray Ruins, it’s a must. 7. Running Along the Beach in Lima - During my six days in Lima, there were only two mornings that were not foggy. The first morning I didn’t take advantage of, which I quickly realized was not a good idea, but the second beautiful morning proved to be exactly what I needed: a morning run along the beach in Lima that was truly a magical way to start the day. 8. Watching School Kids March Around Plaza de Armas in Cusco - While in Cusco, I had the unexpected and wonderful opportunity to see kids from one of the few mixed gender schools march around Plaza de Armas while some of them played instruments as part of the marching band. I’m honestly still not sure of the reason why they did this, but I’m so glad I witnessed it. 9. My Last Peruvian Meal at Punto Azul - I ate very well in Peru, but my very last meal in the country was easily one of my favorites. Punto Azul in Miraflores is a no-frills spot where the food is flavorful and the vibe is relaxed. Get the punto azul ceviche and squid ink risotto when you’re there. You won’t regret it. 10. My Last Sunset in Peru - My very last sunset in Peru was truly the most spectacular one and easily one of my favorite sunsets ever. It was the same day I ran along the beach, and at one point during the day, the fog drifted in but then quickly dissipated, leaving only the sun. It was Lima at its best as the sun slowly lowered itself into the horizon. Peru, we had some fun times. I’ll be back!